This entry was posted in Art, Entertainment, History, Pin Ups, Vintage and tagged Advertising Art, art, brown and bigelow, calendars, Gil Elvgren, Glamor, illustrations, models, oil on canvas, pin ups, pin-ups, Pinup Girl. Great minds think alike (sooner or later…) XO Excellent! I’m glad you enjoyed it, because I enjoyed yours very much. 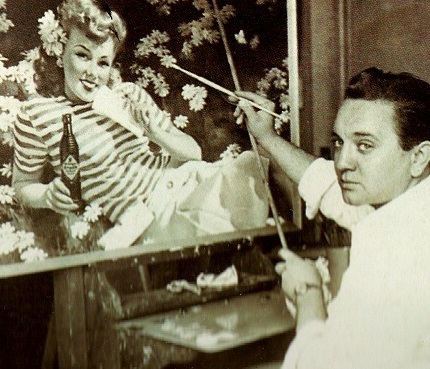 I can’t read every book, know every artist, or memorize every quote, but I just added Gil Elvgren to the memory bank. Thank you sir. These are so pretty. I love vintage pin-ups.. I love Vintage pin ups. I hope you like them… the ones on Zoe Mozert and George Petty are my favorites, I think. thank you so much.. I appreciate your kind feedback ! I love pinup art! Thanks for this great post and for helping me get to know Gil Elvgren as an artist. Thanks for dropping in and commenting ! Cheers! I love that style of artwork! All of the faces and colors are so luminescent and lively. yes, it certainly is easy on the eyes. Thanks for dropping by! The work is absolutely fantastic, isn’t it!?! It also brings back so many memories to so many people. yes, he really was a terrific artist, and his work is wonderful and easy to look at. I’m glad you enjoyed it !! Gil Elvgren really did some beautiful work alright, and I’m glad you liked em !!! I actually have a big book of his art (and I am a straight woman and married). I just love the artwork and the style and the beauty. I wouldn’t mind looking like any of them! I don’t blame you …he really had an ability to put a certain je ne sais quoi into his canvases. Still, a real woman is always much more beautiful. thank you for your comment ! !